Welcome to the SFPE Great Plains Chapter web site! Please review our site and contact us at at sfpegreatplains@gmail.com if you have any questions about our Society. You can also click Join Us if you are interested in becoming a member. To renew an existing Chapter membership, click here. The SFPE Great Plains Chapter has donated $1,000 to the Tangier Shriners Transportation Fund! 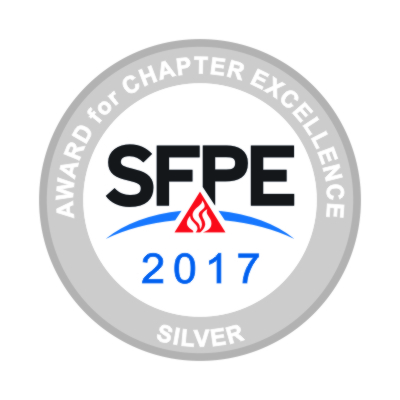 Our Chapter has received the SFPE 2017 Award for Chapter Excellence! “To provide a means of professional networking and knowledge advancement for the fire protection industry in the Nebraska, Iowa, and South Dakota regions." Fire Guard www.fireguardusa.com, is offering equipment at 30% off and another 10% discount for cash or check payment. Credit cards would be an additional 3% to cover the cost of credit card payment. Contact information is Bob Sorensen robert.sorensen@fireguardusa.com, 402-699-7983. General Fire and Safety Equipment, www.gfsomaha.com, is offering their employee discount for fire extinguishers, alarms and first aid kits for SFPE member. Contact information is Jason McDonald jasonm@gfsomaha.com, 402-556-6100. Associated Fire Protection www.associatedfire.net, would like to offer the SFPE Great Plains Chapter membership a 15% discount on ABC and Class K fire extinguishers. Also, we would like to extend an additional 20% discount for any members wishing to conduct fire extinguisher training for their office. Contact information is Andy Blaszak ablaszak@associatedfire.net, 402-733-2800. SFPE Great Plains chapter - Student Outreach The Great Plains chapter of the Society for Fire Protection Engineers wants to reach out to high school and college students regarding careers in the field of Fire Protection Engineering. The SFPE has a presentation on Careers in Fire Protection that can be shared with high school or college students studying Engineering & Architecture. We would like to present it to the classes directly, or share it so the educators can present it if that is preferred, in order to encourage interest in the field of Fire Protection. The SFPE’s ‘Chemistry of Fire’ is geared to high school chemistry students. It will teach students the science behind fire as a way for students to fully understand the dangers of fire. As a result, it will increase the awareness of fire and the importance of home fire prevention. When chemistry students see real world applications of this fascinating science they may be inspired to explore an exciting career as a fire protection engineer. The interactive program comes on a DVD that can be distributed to educators as needed and there is a website with additional resources SFPE EDUCATION. SFPE 2016 Award for Chapter Excellence!